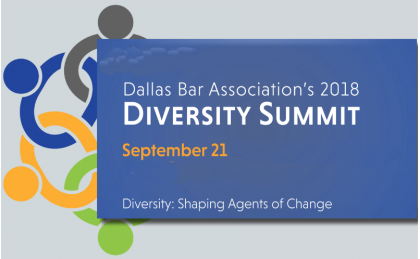 On September 21, 2018, Lauren Beverly attended Dallas Bar Association’s 2018 Diversity Summit. The theme of the Summit was “Diversity: Shaping Agents of Change.” During the Summit, attendees learned strategies for effectively engaging in discussions about “courageous” issues of race as well as other sensitive or hot-button matters; heard speakers, including the Mayor of Dallas, reflect on the benefits of diversity in the business and legal worlds and beyond; and discussed ways in which corporations are using their corporate influence to effect change in the diversity of attorneys in the legal field. The Summit was a welcome opportunity for attorneys in Dallas to reflect on the current state of diversity in Dallas and the legal community at large and develop strategies to increase diversity in these areas.